Ken has taken me on so many amazing dates since we met. It was one of the things I liked most about him, in fact. Not just going on those nice dates, but the fact that he genuinely likes doing those things himself. He wasn't just trying to impress me in the beginning. I quickly figured that out when I realized that we did so many of the same things separately, before we met, and that we have a lot of the same favorite places around Tulsa. We both love places like Philbrook, the Rose Garden and Woodward Park, Utica Square, Brookside, Riverside, etc. 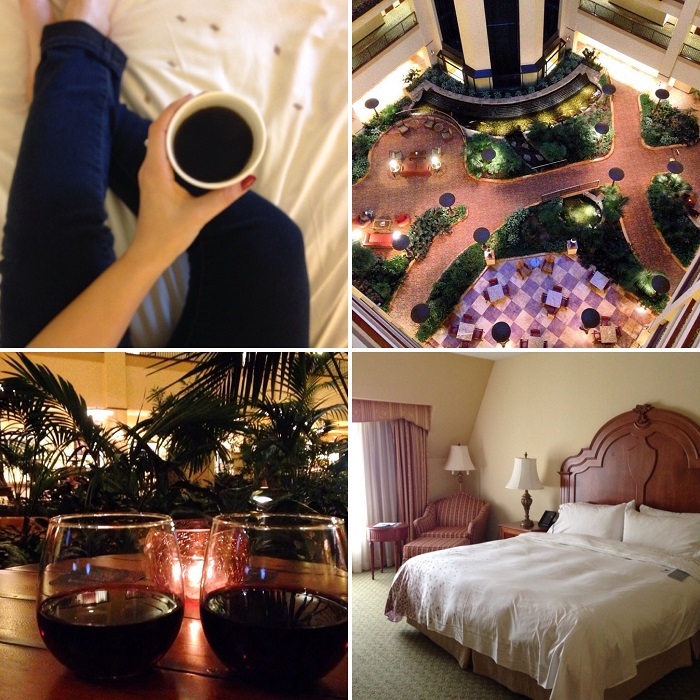 One of my favorite date nights has been our monthly hotel stay. We have three kids and a German Shepherd...it makes a world of difference to get away from all of our responsibilities, even if just for the night. I highly suggest you give it a shot. Having a relaxing date where you can still snuggle in bed and do nothing, but where you don't have to clean or pay bills or nag the kids...it works wonders. One of our favorite places to get away for a little staycation is the Renaissance Hotel. It isn't quite as expensive as the boutique hotels downtown, and it's still very, very beautiful and luxurious. You can grab wine from the bar and sit in the beautiful courtyard with the koi pond and fountain in the background. And it's right by some nice restaurants and Cinemark if you want to catch dinner and a movie. It's the perfect place for some romance. Another favorite we'd suggest is the Courtyard Marriott downtown Tulsa, especially if you're headed to the ballet. 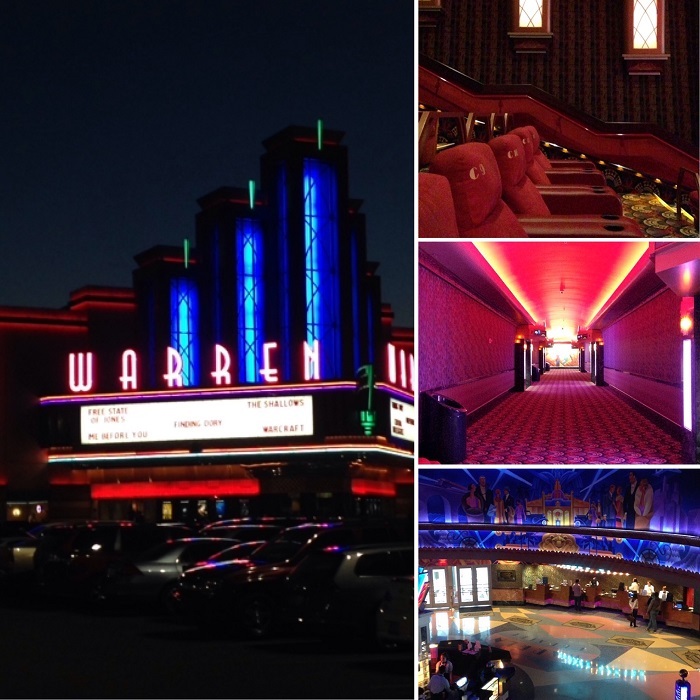 When it comes to movie theaters, there is no better place in the Tulsa area than Broken Arrow Warren Theatre. Ken took me there for our second date, and it was such a great experience. 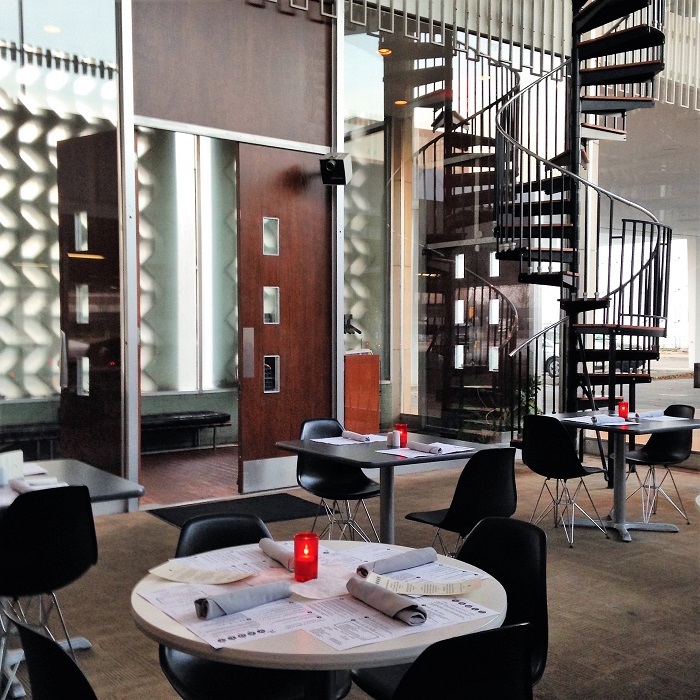 There is a restaurant, diner, and bar in addition to the movie theater, though you can order your dinner and drinks during the movie if you pick from the Balcony or Director's Suite. There is still a full concession stand and plush recliner seating in the regular screening rooms as well. We've gone back so many times since then, so it's not only a great place in general, but a romantic reminder of one of our first dates. Philbrook Museum of Art is another place we've gone to many times, as I'm sure you know if you regularly read the blog. I posted about it long before I met Ken and was delighted to find that he likes it just as much as I do. It's so beautiful inside and out, from the building itself to the special exhibits, and the restaurant and gardens. Definitely one of the best places in Tulsa for a classy and romantic date. 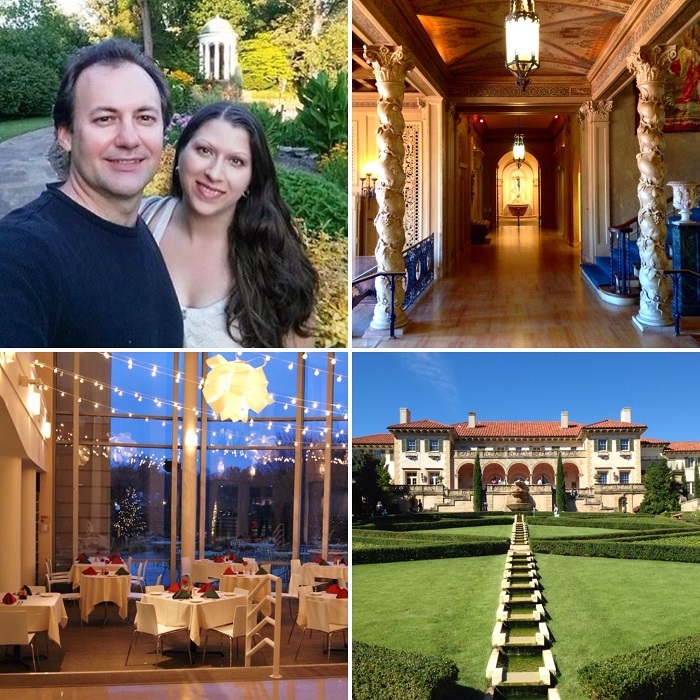 They also host special events, from wine tastings to movies on the lawn, and our favorite, the Philbrook Festival when they turn on lights for the holiday season. Pinot's Palette on the other hand, we've only gone to once, but it's definitely worth noting. It was such a fun date to go on when we were getting to know each other. 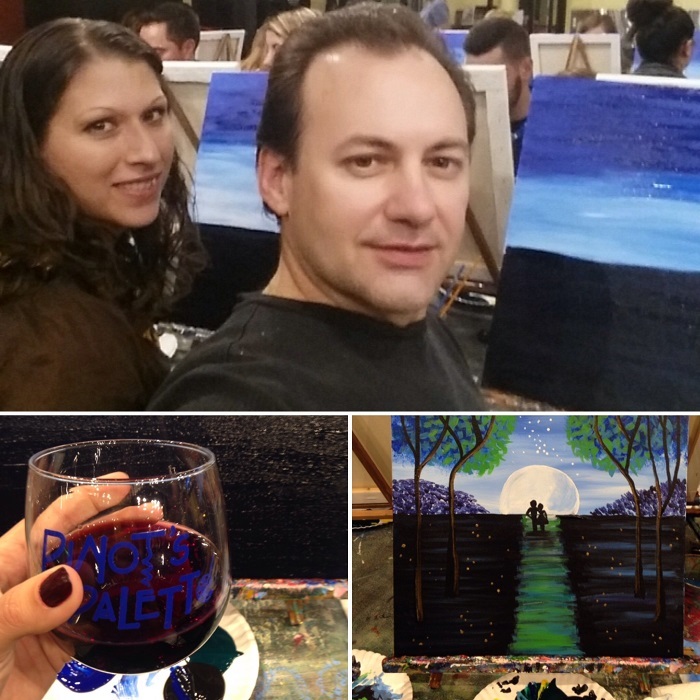 You're listening to cool music, trying to paint something (led step-by-step by an instructor), and most importantly drinking wine! It's the perfect way to unwind and cozy up to your date while having a very fun time. My favorite part was that we wound up with keepsakes. Whenever I look at our paintings, it reminds me of that date. You can view their schedule before purchasing tickets to pick exactly which painting you want to make. One of our favorite things to do whether as a part of a date or the date itself is to grab a cup of coffee. There are so many cozy local coffee shops in town, and most of them are conveniently located near pretty shopping areas and beautiful parks. 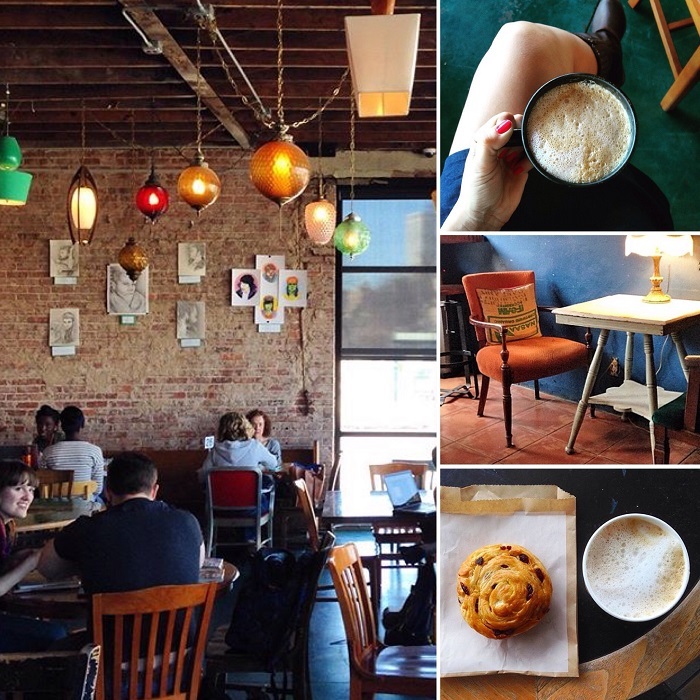 Some of our favorites so far include The Phoenix, The Coffee House on Cherry Street, 918 Coffee, Foolish Things, Shades of Brown, and of course Starbucks. Yes, the local places have their charm, but our first kiss was in a Starbucks, and we ended our very first date at the Starbucks cafe in Barnes & Noble. 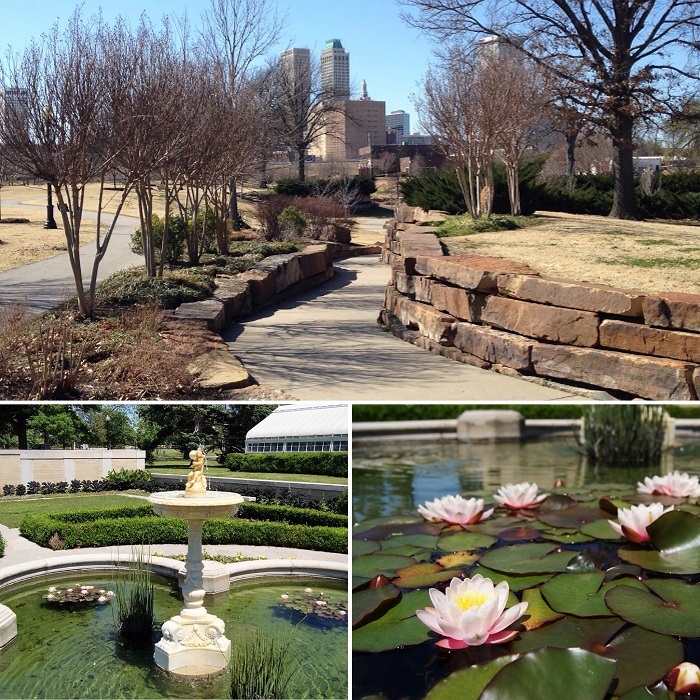 When the weather is mild, we like to grab a cup at Phoenix and head over to Centennial Park (pictured above middle). 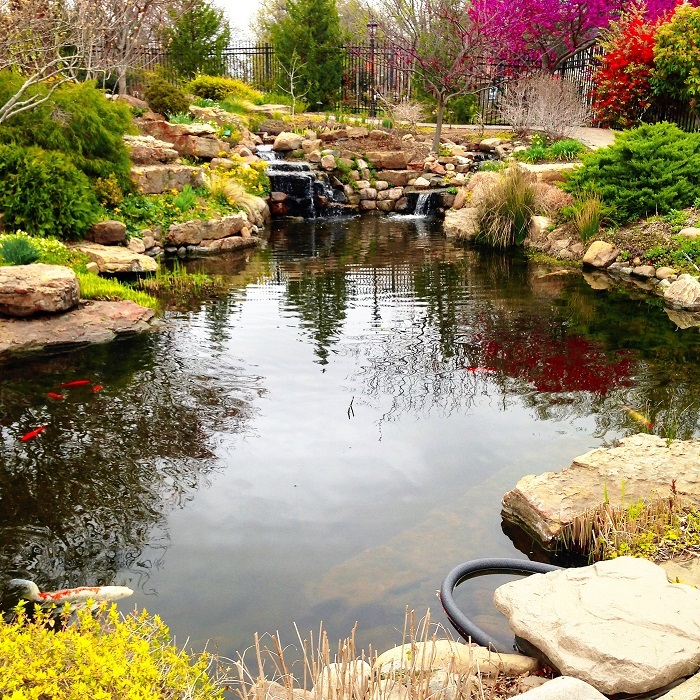 We also enjoy the Woodward Park area - the Rose Garden and Tulsa Garden Center, and the Linnaeus Teaching Gardens (pictured above). When it's too cold for the park, we grab coffee on Cherry Street or Brookside and enjoy some window shopping, or we stroll around Barnes and Noble. After we moved to Broken Arrow, we discovered a fantastic place for walking and talking and window shopping. 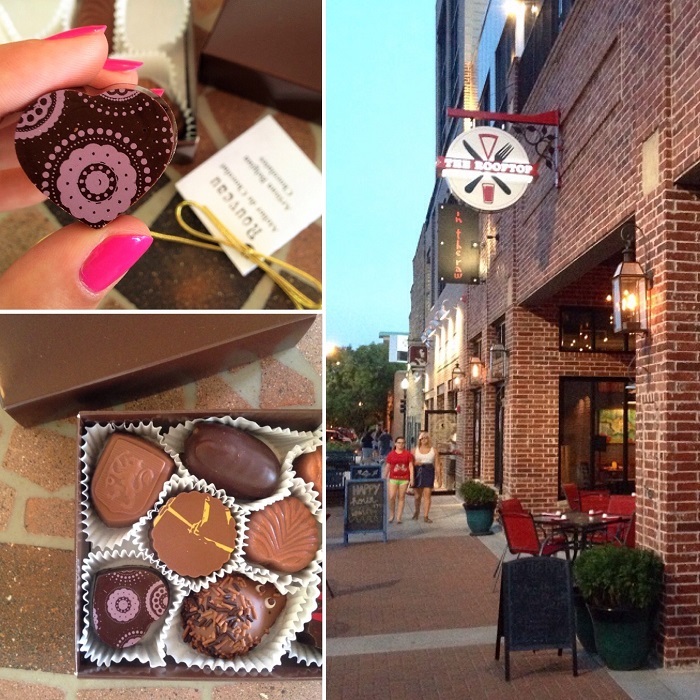 The Rose District on Main Street in Broken Arrow is packed full of cute shops and amazing restaurants. There isn't a coffee house on the main stretch, but you can get coffee at my favorite little chocolate shop Nouveau Atelier de Chocolat. I do believe I've eaten out more times since I met Ken than I have in my entire life. He is just as passionate about good food as I am, and we have gone to some amazing restaurants in Tulsa. We're all about trying new places but also make time to return to our favorite places and the places that hold sentimental value. Zio's for example, is where we met and had our first date, so it's always romantic to go back there. A recent favorite is Roosevelt's on Cherry Street. It my not be suited for a super fancy dinner; but it has amazing decor and a very cool atmosphere, not to mention delicious food and countless drink choices. It's actually well-suited for a first date, because it's very nice but has a cool and relaxed feel to it, and is quiet enough to talk but not so quiet that there could be awkward silences. I'd say the same is true with Zio's and El Guapo's. Claret Cafe is without a doubt one of the most underrated restaurants in town. It has such a cozy, beautiful, and romantic environment, decent prices, and very delicious food. We have so many other favorites when it comes to semi-casual dates; like Lassalle's, Fish Daddy's, etc. A few more of our favorites for a nicer dinner date include Abuelo's, Smoke on Cherry Street, and The Vault (pictured above). If you like the arts as much as we do, the Tulsa Performing Arts Center is the place to be. We catch a few ballets each season. It's another thing I'd envisioned for my life...something I knew I would love to do more often, especially if it could be with someone I love, and Ken has made that come true for me. It is after all, one of the few places in Tulsa to get all dressed up for. It's fun to feel fancy for a night and watch a beautiful show with someone who enjoys it as much as I do. For our Valentine's Day date this year, we're going to see Dorothy and the Prince of Oz. 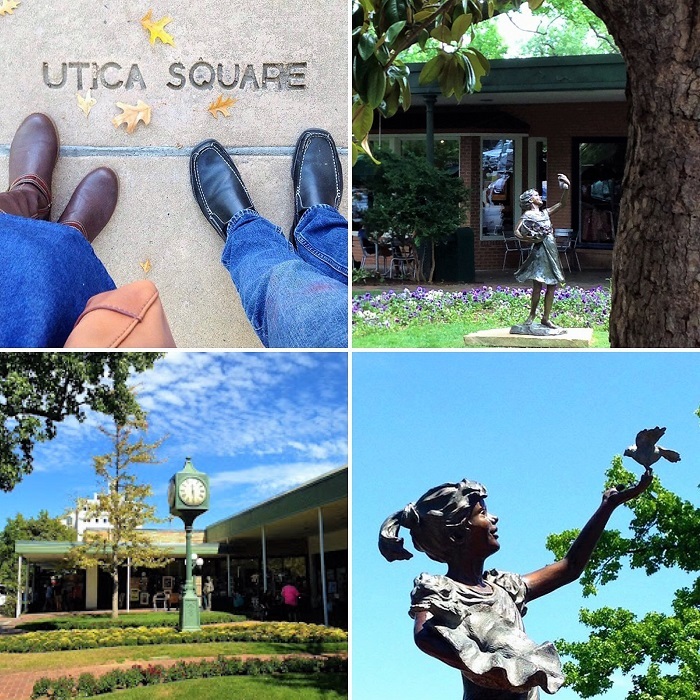 Another place that we go to frequently for sentimental reasons and simply because we like it so much is Utica Square. It's such a pretty place to walk around and shop...or talk and kiss. :) And there are some nice restaurants there as well, in addition to Starbucks. It holds sentimental meaning for us, because it was where we had one of our first few dates and where we decided we both were definitely interested in an exclusive relationship. Our mutual love for the arts, culture, movies, coffee, and nice restaurants makes for an wonderful dating life. We still go on a nice date at least once a week, and often a few dates each week, and we plan to keep it that way. We both believe in putting forth effort to keep the romance and passion going strong. Though I don't want you to feel you have to spend a lot of money to be able to have romance. Warren Theater for example, has $5 Wednesday movies, and places like Philbrook are under $10 per adult admission (with free admission on second Saturdays). 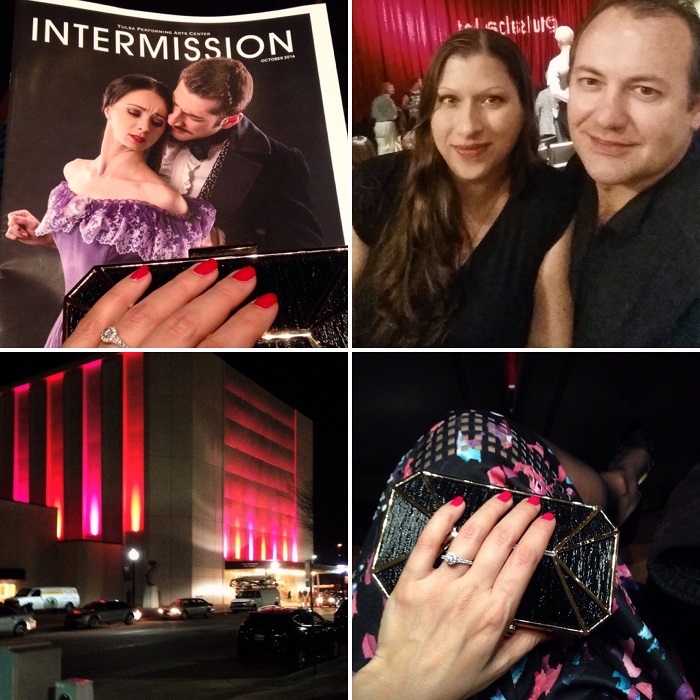 Whether it's a fancy hotel stay coupled with a night at the ballet or a simple cup of coffee and going for a walk, every date with my husband is time very well spent. 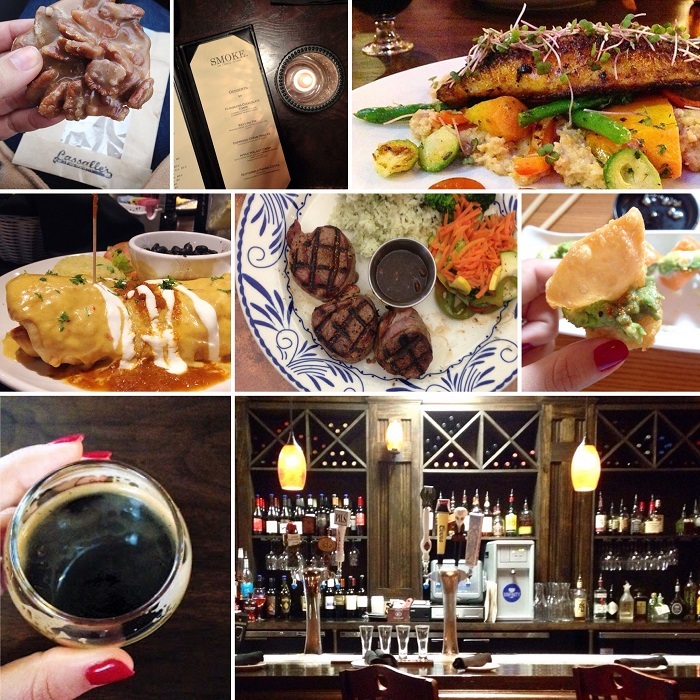 :) Feel free to keep up with our dates and restaurant picks on Intsagram! The art museum is a beautiful place. Such cute and great places! Thanks for sharing! This is such a good roundup! I love being able to stay the night at a hotel. You're so right, it does let you kind of escape other distractions better. Didn't realize that Tulsa is such a great place. You make me want to go visit.